Freshen up the inside of your home or business with interior painting from MNPro Painting Services. Located in Andover, Minnesota, we serve the Twin Cities metro area and surrounding suburbs. We hope you also consider us for painting or power washing the exterior of your building. We are incredibly thorough when we prepare to improve the interior of your building. It's not enough to just start painting over what's already there. To get your rooms ready for painting, we do wallpaper removal, repair minor drywall issues, fix cracks and holes in the walls, and scrape any flaking paint. We mean business when we refresh your rooms, which is why we are very careful when taping off windows and caulking baseboards and trim. Ensuring the area is cleaned up properly is also important, which is why our team also removes any hardware such as shelves and refastens them when were done. The only thing we'll ever leave you with when were finished is a beautifully painted interior. 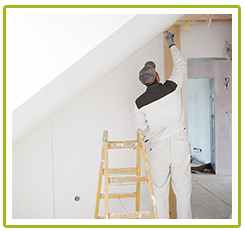 MNPro Painting Services paints and prepares as much or as little of the inside of your home as you like. When you call us, we will go over in detail what exactly you want done and give you a free estimate. Your time is important to us, which is why we always show up on schedule.